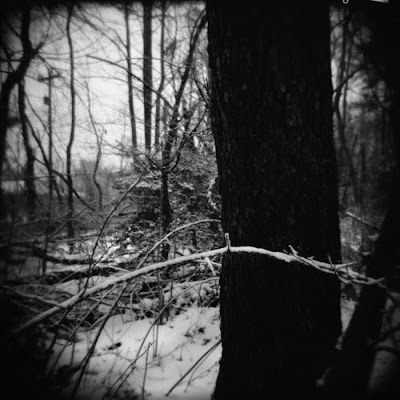 The Holga never seems to disappoint, even when its handler is less than enthusiastic about the subjects it captures. Of course, this was the first week of the Snowpocalypse and snow was absolutely the only thing around. I finished off an old roll still in the camera, which had pictures that I had taken in Annapolis (during the warm summer light). I had a nice one of the old barn, but how many blog posts can one do on a barn that is just a lump of lumber? 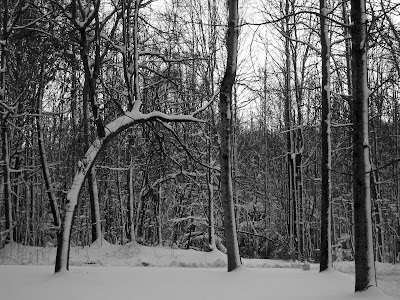 So, the selection of the week was from the roll of Ilford 3200 that was completely shot in the back yard during the snow. OK, I could finally get out of the house today and pick up my film from Richmond Camera. This roll was from the nameless 35mm panoramic camera I bought on eBay for $5 (including shipping). It is the most basic point & shoot camera (no controls at all) and ONLY takes panoramic pictures. Well, to my surprise every negative came out nicely exposed (however, not all were nicely composed). The real challenge came in cutting the negatives as there is maybe 2mm space between them. There is also this odd looking light leak that occurs occasionally and with no obvious reason. I have 2 negatives that were taken in the same general direction within seconds of each other and one has a leak, the other does not. The lens does seem to be very fuzzy (maybe needs a good cleaning). And since it only cost $5, I won't mind taking it apart and checking out the insides. I may even be able to fix the image counter! All in all, I was happy with this first roll. Here is my favorite of the bunch! Hopefully, I will get my film back from my CotW 4 (Holga) in a few days. This week's camera is the Pinhole Blender Mini 120.